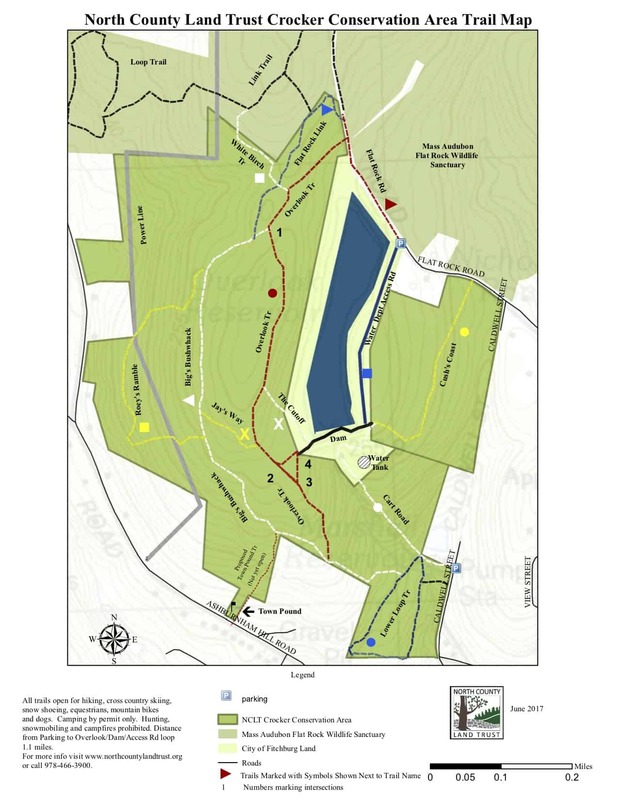 Located less than one mile north of Fitchburg Common, the 150-acre Crocker Conservation Area offers a gateway to over 2,500 acres of protected land, abutting the Audubon Flat Rock Wildlife Sanctuary and over 2000 acres of watershed land owned by the City of Fitchburg. In 1994, Bigelow and Jeanne Crocker donated 127 acres of forested land to North County Land Trust. In 1999, NCLT learned that 30 acres of city-owned land, containing the 17 acre Overlook Reservoir and a smaller reservoir would be decommissioned, placing the land at risk for conversion by the city to other uses. To protect this important open space next to the Crocker Conservation Area, NCLT offered to give the city 1.5 acres of conservation land on which to construct a water tank, in exchange for a conservation restriction on the city’s land. The Overlook Reservoir Gatehouse, a granite block structure at the Reservoir dam, can still be used to control water in the reservoir. In 2003, the Crocker Family donated a 23-acre parcel on Caldwell Street to augment the Conservation Area and increase its size to 149 acres. The historic Fitchburg Town Pound is part of the Conservation Area, located at the Ashburnham Hill Road entrance. Once used to impound wandering livestock, the Town Pound is comprised of a stone wall enclosure and a gate and was recently restored by the land trust. 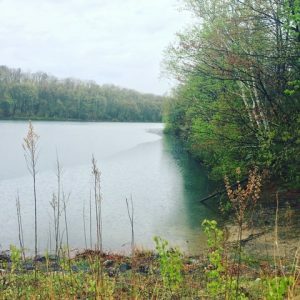 Today, the central feature of the Crocker Conservation Area is the beautiful Overlook Reservoir, and walking the relatively flat trails around its perimeter provides a favorite loop for many local people. For those who wish to explore further there are 4 miles of trails ranging from cart roads to single track trails, which cover a wide variety of terrain and provide many options for other loops. The spice bush is stunning on the Lower Loop trail in April, the Mountain Laurel lights up Big’s Bushwhack at the Summer Solstice and blueberries are a great snack in July! Crocker Conservation Area welcomes multi-use recreation and is a favorite destination for dog walkers. Hunting and motorized vehicles are prohibited. From the north end the trail gently descends following a skidder road from the recent timber harvest. Making a turn to the south it follows an old stone wall. Approaching the southern end of Roey’s Ramble the trail narrows and the footing becomes rockier and meanders through stands of mountain laurel which are a sight to behold around the Summer Solstice. It then starts a much steeper descent until its reaches its southern end at the Lower Loop Trail. From its northern end the Cart Road starts on the right hand side of the Water Dept Access Road in a grassy area below the Overlook Reservoir dam. It soon turns sharply to the left and starts its rather steep descent to Caldwell St. The trail begins a little distance southeast of the parking area on the paved section of Flat Rock Road. You will pass its entrance on your left as you approach the parking area. Beginning at Flat Rock Road, the trail is a beautiful old woods road bounded by stone walls that is relatively flat and wide. Towards its end it turns sharply to the right and narrows substantially before connecting with the Water Department Access Road just across from the Overlook Reservoir dam. Flat Rock Road is a paved and maintained road until the Crocker Conservation Area trailhead. At the trailhead, it is gated preventing vehicle access. The road continues along the boundary of Crocker Conservation Area and on into the Mass Audubon Flat Rock Wildlife Sanctuary. It ends at Scott Road in the wildlife sanctuary. A single track, dirt relatively flat trail that follows an old skidder road and links the Overlook Trial to Big’s Bushwhack. A little known and little used but lovely loop trail. Starting at the northern end where the trail meets the Cart Road bear to the right and pass over a small stream. This area is beautiful in April when large areas of spicebush are in bloom. The trail soon passes the southern end of Big’s Bushwhack and will eventually turn sharply to the left. Continue along until the trail turns sharply to the left again. Returning on the eastern side of the loop it passes by a narrow, unmarked single-track trail (providing a connection to Caldwell St) before arriving back at the starting point at the Cart Road. The most popular and well used trail at the Crocker Conservation Area. Beginning at the northern end where it leaves Flat Rock Road, the Overlook Trail is a flat, dirt woods road. Shortly after passing the intersection with The Cuttoff it narrows to a single-track trail, the surface becomes a little more uneven with some rocks and it starts a very gradual descent which continues until its southern end where it intersects with Big’s Bushwhack. A very popular loop that is a little more than a mile in length is to begin at the parking area at Flat Rock Road, follow Flat Rock to Overlook. Stay on Overlook but at trail marker #2 (see map) take a left to cross the Overlook Reservoir dam and then take a left to return to the parking lot via the Water Department Access Road. The most challenging trail at Crocker Conservation Area. Starting from its northern end on Big’s Bushwhack the trail starts descending gradually through the woods, crosses the power line and continues its gentle descent until it turns sharply to the left and climbs steeply, crossing the power lines and eventually again connecting with Big’s Bushwhack at its southern end. A short, fairly steep single-track trail that provides a short cut from Overlook Trail to the reservoir dam. The gated road begins at the parking area on Flat Rock Road and provides vehicular access to the City of Fitchburg to the Overlook Dam and the water tank. It is part of a popular loop at the Crocker Conservation Area that is a little more than a mile in length. Beginning at the parking area at Flat Rock Road, follow Flat Rock to Overlook. Stay on Overlook but at trail marker #2 (see map) take a left to cross the Overlook Reservoir dam and then take a left to return to the parking lot via the Water Department Access Road. A single-track trail that links the Overlook Trail at Crocker Conservation Area to the Flat Rock Wildlife Sanctuary Link Trail. On CCA land the trail crosses an area that was harvested for timber in recent years and it passes through an area of young white birch on Flat Rock Sanctuary Land offering an interesting contrast in scenery. A peaceful woodland trail following an impressive stone wall that links Flat Rock Road to Big’s Bushwhack and the Mass Audubon Link Trail. Camping is for non-profit educational groups ONLY. Hunting and motorized vehicles are prohibited.